Each year we visit the ANA World’s Fair of Money to get a feel for the overall coin market and to acquire truly rare coins for you. The show was a bit quieter than in years past which was a good thing for coin buyers all over the country. Many buyers in the coin market have been distracted this summer. With the precious metals market surging, the stock market pushing all-time highs, and the normal distractions of the summer season, the rare coin market has been quiet. One of the most compelling stories in the history of collectible coins is the SS Central America. Known as the Ship of Gold, this ship sailed between Central America and the east coast of the U.S. transporting gold during the 1850s. During a particularly violent hurricane the SS Central America sank, taking 425 of its passengers and 30,000 pounds of gold minted by the U.S. Government to the ocean floor. Nearly $2 million of gold, currently worth $50 million, was lost. The loss was so significant that public confidence in the economy was shaken and it became a major contributor to the Panic of 1857. This was the first “world-wide” economic crisis in history. Full recovery in the U.S. economy wasn’t seen until after the completion of the Civil War in 1865. This past weekend was the 28th anniversary of the SS Central America wreck discovery. Since then, many coins have been recovered from the ocean floor, but only a few remained in pristine condition. Take advantage of this unique opportunity for you to invest in these recovered coins. There are around 10 known Uncirculated examples of this date with most in the MS60 to MS62 range. The present example is among the finest known, and it is tied for the best found on the SS Central America. This nicely toned piece has a few grade limiting scuffs in the left obverse field and is identifiable by a small obverse rim mark below the 57 in the date. This coin was part of a remarkable three-coin 1857-S set which I offered intact last month but was unable to sell it as a group. 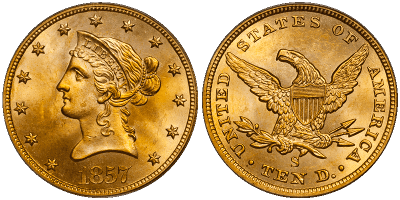 It is now being split up with each coin offered individually; the half eagle and eagle are also available. CAC has approved three in this grade with none finer. least an MS64+ if not a full MS65. This coin is essentially "as made" with razor sharp detail, full frosty luster, and glowing golden-range and rose colors. A few tiny scuffs can be seen in the right obverse field while the reverse grades at least MS66 to MS67 on its own. The eye appeal which this coin shows is finer than on any No Motto half eagle from San Francisco which I have seen or am aware of with the possible exception of the famous Gem Norweb/Bass 1864-S (a strong six figure rarity in today's market). This remarkable coin is one of the finest known branch mint No Motto half eagles and it is also significant as one of the more important items to have been found on the SSCA. CAC has approved this one coin in MS64 with none finer. 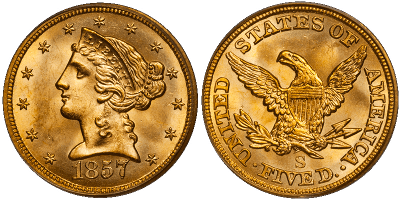 The 1857-S is one of the more available No Motto San Francisco eagles, but it is very rare in Uncirculated and extremely rare in any grade above the MS60 to MS62 range. This is one of two PCGS/SSCA MS64 1857-S eagles to have been found on this shipwreck and it is clearly the finer of the two by a considerable margin. In fact, it is one of the two finest San Francisco No Motto eagles of any date of which I am aware, exceeded only by the remarkable PCGS MS64 1865-S/Inverted Date from the S.S. Brother Jonathon which sold for $115,000 in its initial auction appearance in May 1999. The coin is absolutely exceptional and, in my opinion, it would grade at least MS64+ if not a full MS65 if it were regarded according to today's standards. It is literally "as struck" with glowing golden-orange color, blazing luster and remarkable detail. The eye appeal is considerable and this coin is even more beautiful in hand than it is from the accompanying images. 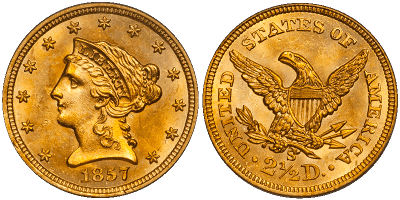 If you are an advanced collector of Liberty Head eagles, high-grade San Francisco gold or shipwreck coinage, this remarkable 1857-S eagle is a prize which could not be duplicated at any price. CAC has approved this one coin in MS64 and none finer. From the $50 million worth of gold that was recovered from the SS Central America, you can own three of the finest coins recovered from the shipwreck. Call us at 800-831-0007 or send us an email to own a piece of history and invest in these remarkable coins recovered from the Ship of Gold. *Prices are subject to change due to market fluctuation and product availability.